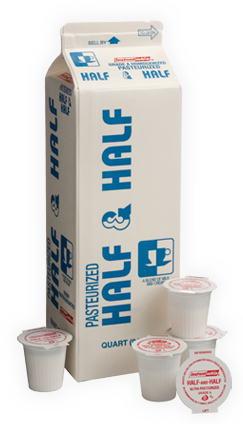 In coffee, tea, cereal, cocktails or recipes – quality half and half is a must for your food service creations. And INSTANTWHIP® HALF & HALF fills the bill when you need the rich taste of dairy-fresh half and half. We’ll see to it that it is delivered fresh to your door with the traditional and creamy taste you expect. Choose from half-gallon units or convenient portion controlled cups. Ideal for carryout, room service, or placing directly on the table. Whether you’re continuing a tradition or experimenting with new tastes and uses – INSTANTWHIP® HALF & HALF delivers. Ordering INSTANTWHIP® Half and Half from your local Route Sales Team, online or with a phone call couldn’t be easier. OUR HALF AND HALF EQUALS A WHOLE LOT OF OPTIONS. INSTANTWHIP® HALF & HALF in ice cream? For some newer, modern flavors, Half & Half makes a lighter base so that new flavors or new flavor combinations can really stand out. CHOCOLATE SAUCE OR TOPPING? INSTANTWHIP® HALF & HALF works as well as cream – and even makes a great fondue. Instead of water, milk or cream – try INSTANTWHIP® HALF & HALF in scrambled eggs. They’re creamy, light, and fluffy too. INSTANTWHIP® HALF & HALF can even get saucy. Deglazed pan sauces, marinara – just add a touch for a new, creamy, dairy-fresh flavor. Have a bartender who likes to experiment? Try INSTANTWHIP® HALF & HALF in cocktails – it’s rich and creamy without being as heavy in flavor or texture as traditional cream. Grade A Milk, Cream, and Sodium Citrate.